This interesting and unusual name is of Anglo-Saxon origin, and has the distinction of retaining its original forms after the Norman Conquest of 1066, after which many native English names were "Normanized". 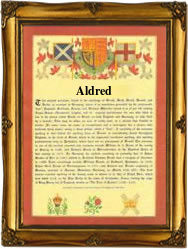 The modern surname, found in the forms Aldritt, Andritt, Aldred, Alred, Allred, Eldrett, Eldritt and Eldred, derives from the Middle English personal name "Aldred", which represents a combination of two Olde English pre 7th Century personal names: "Ealdraed", composed of the elements "eald", old, with "raed", counsel, and "Aethelraed (Ethelred)", from "aethel", noble, with "raed", counsel. The personal name is recorded in the Domesday Book of 1086 as "Aeldred, Aldret, Eldred" and "Eldret". In some cases the modern surname may derive from a medieval English topographical name for someone who lived by an alder grove, from the Middle English "aldrett", alder (trees). One Robert Aldred was an early emigrant to the New World, leaving London on the ship "Thomas and John", in June 1635, bound for the Virginia Colony. The first recorded spelling of the family name is shown to be that of Roger Aldredus, which was dated 1207, in the "Pipe Rolls of Devonshire", during the reign of King John, known as "Lackland", 1199 - 1216. Surnames became necessary when governments introduced personal taxation. In England this was known as Poll Tax. Throughout the centuries, surnames in every country have continued to "develop" often leading to astonishing variants of the original spelling.